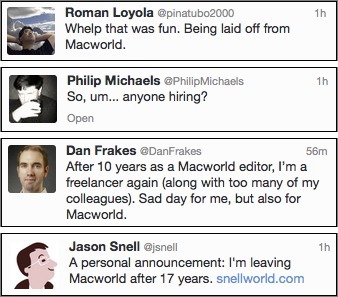 My Twitter feed exploded last week with the news that numerous long-time Macworld editors, including Dan Frakes, Roman Loyola, Philip Michaels, Dan Miller, and Dan Moren have been laid off. (There is no truth to the rumor that Macworld parent IDG just had too many editors named “Dan” on the books.) In addition, Jason Snell has quit; he was a senior vice president and editorial director for IDG Consumer. Specific details about what happened emerged quickly afterwards, with Macworld Editor Dan Miller confirming that the print edition of Macworld would be going away and the macworld.com Web site would continue with a reduced staff. The timing was particularly grating, since a number of the Macworld staff had put in especially long hours the day before covering Apple’s announcement of the iPhone 6, Apple Pay, and the Apple Watch. Whether the timing was intentional or just part of a pay cycle, IDG should be ashamed. IDG has made no official statement, either about the layoffs or the closing of the print edition of Macworld, and the company’s business-as-usual home page displayed a wonderfully awkward Twitter feed box showing tweets from the laid-off editors. New editor-in-chief of Macworld Jon Phillips wrote an article introducing the new Macworld staff: Susie Ochs, Chris Breen, Leah Yamshon, and Caitlin McGarry. He also noted that Macworld would be relying heavily on freelancers in the future. We at TidBITS are tremendously sorry to hear about the layoffs. These people have been friends and colleagues for years, and although occasional turnover in the industry is inevitable, mass layoffs like this are deeply unsettling. Some of them have written for TidBITS and worked on Take Control in the past, and all have been mentioned in our pages. We hope to have the opportunity to work with them in the future. Also sad is the demise of the print edition of Macworld. Since the launch of the Macintosh in 1984, Macworld has been a stalwart of the Mac community, a role that has continued through the 1997 merger with MacUser (see “MacUser and Macworld Merge,” 11 August 1997) and the disappearance of MacWEEK (“MacWEEK to Roll into MacCentral,” 5 March 2001). But with circulation reportedly dropping from 160,000 in 2013 to 135,000 this year, the writing for Macworld’s print edition was on the wall, despite Apple’s current dominance in the technology industry. The management team behind the scenes didn't know what it had, didn't know how to make it profitable, and approached it all wrong. Those are some great people, and I am confident they will do more great things. Sad, though, to see them all so crappily treated, so suddenly. I love two things, Macintosh and Golf. Two months ago Conde Nast shut down GolfWorld which was the oldest golf magazine in the world. Very sad that these big companies can't handle titles like this. It's best to be lean and mean like a MacLife. Good luck to you and the staff of MacWorld, hope you bounce into something good. One other question and maybe Lex or someone else at MacWorld could answer. In reading a story of the merger between MacUser and MacWorld they said the circulation was 695,000. What was the circulation of MacWorld now??? I am sorry but those "suits" at IDG were probably at Ruth Chris eating big steaks and washing the blood off their hands of firing the staff with some martinis. Not to be rude but in cases like this the folks that do the writing and editing, really working their butts off while the folks that screwed up and made errors in judgement are the ones that keep their jobs (six figures of course) and their big expense accounts. With a circulation of 200,000 IDG should be ashamed of not trying to make a run to keep the doors open, even if it meant ditching the print version and only producing the digital product. Class-less these companies like IDG and Conde Nast who shut down Golf World, another iconic magazine, a month ago. That's our future I am sorry to say. Big companies like IDG having to make big profits or they shut something down. "The management team behind the scenes..."
Agreed. Those of us behind the scenes saw/knew that "team" was driving the magazine/company/Expo into the ground. The timing of this announcement really makes it clear what kind of company IDG is. I am so sorry to see this, other than MacLife there are no more American Macintosh magazines. I hated when we lost MacUser and MacWeek, all of them merged into Macworld. This is awful. I love the print edition and have been a subscriber forever. I rarely look at the electronic version. I too was/am a subscriber since '84. Ironically I sent in my check last evening to renew my subscription. Wonder if I get my money back. Will miss the information all the "guys" provided. Best of luck to all of them. As Adam wrote above, we at TidBITS are tremendously sorry to hear about the layoffs. I've worked with these folks, and I've read their work over time. Sure, they had their off days, but by and large they consistently wrote, edited, and published top-quality, well-researched articles that went way beyond the press release or the marketing points that they were "supposed" to write about. The depth of experience that they brought to their work, coupled with the relationships they'd developed over many years with others in the Apple community made this crew special. There were some layoffs earlier this year, too, and those people were also part of this group. And there were earlier layoffs, too, at least one round that I can recall, with important people dropped from the fold. Brent Simmons at inessential.com wrote "If we could deliver a standing ovation via Internet as these folks leave this particular stage, we would. It’s so deserved." I'm standing up applauding now. I’m standing next to you. Tonya: "For me, a lot of Macworld is/was the people, because I felt that by knowing the person I could better judge the reliability of the info." Me: "So true. I was rarely sceptical of anything Dan Moren, Dan Frakes, Jason Snell (and many others there) wrote because I trusted them. And if I ever was sceptical of them, I doubled checked because I knew they were probably right. :)"
Macworld has "announced" they will carry on with "valued freelancers". Sorry but I can read freelancers all over the web. Macworld was a place I could read honest, trusted info from people I knew personally and trusted. Macworld/IDG just didn't/doesn't see the value in that. R.I.P. I started writing for Macworld back in, yes, 1984, when it was just little upstart. Sympathy to my colleagues who are out of jobs. Thank you to all who worked at Macworld. Have been a long-term subscriber since Vol. 1 Number 1 (which I still have). Several years later I did PR at Digital Equipment Corp. and helped Jason Snell review VAXen in his basement. Writing is universal... you guys will find new positions. These are experienced, talented, and capable people. I'm sure they'll find other employment, perhaps even at Apple. I suspect IDG didn't want to pay what their ability costs. Look for their positions to be filled with recent college grads desperate for work. Digital magazines are nice, but you can't put one out in your waiting room, or go to the public library and browse through it. Thanks everyone for your kind thoughts. The group at Macworld is just an amazing set of people. I plan on being friends with them long after we've forgotten where we put our medication. I'm always been impressed, not just with the quality of your work, but also with what the production editors did with the design of the magazine. You and your team will be sorely missed. You and the rest of the MacWorld team are a classy bunch. I'll miss the magazine and your reporting very much. Good luck to all. I'm with Tonya. These guys deserve a standing ovation. And an encore. I'm not sure if my memory is failing me, but I remember canceling my MacWorld (print) subscription 10-15 years ago, because Microsoft had purchased it? Had I known that it since had been sold to IDG, maybe I would've restarted the subscription (at a minimum via Newsstand). "I remember canceling my MacWorld (print) subscription 10-15 years ago, because Microsoft had purchased it?" Memory definitely failing. That never happened. You're probably remembering the 1997 merger with MacUser, which resulted in a new company called Mac Publications, jointly owned by IDG and Ziff-Davis. My reaction to this piece of sad news is the same reaction I have when I hear about some 1940s movie star who died "What? They're still around?" In the 1980s and even the early 1990s, I subscribed to both MacWorld and MacUser (they later combined into a single magazine). They offered hope and cheerful news when Apple was adrift. I remember seeing a copy of MacWorld and PCWorld (MacWorld's evil twin) sometime around 2002, and was shocked by how thin the magazines had become. It was you and Ars Technica and MacNN. You all were involved! A grand conspiracy! There was simply no way for MacWorld to keep up. The world moved too fast. The information too technical to do in a breezy format. PCWorld died last year, and I guess it's now MacWorld's turn. Byte is long gone. Ziff Davis is a shadow of its former self. It's sad, but the truth is I haven't looked at MacWorld nor its website in a long, long time. I am sad, but I can't say I'll miss it. I have a paid up subscription to Mac World until May of 2016. What will happen to that now? I sure wished that the USA could produce the quality of magazines that the UK does. I live in the USA but love the UK Mac magazines and subscribe to two of them. Sad to see MW go. This has happened to many magazines I loved in the past. Usually, when a magazine goes under, the companies offer subscribers other magazines to finish out the subscription. If you called and complained, you might be able to get a refund instead. "What will happen to that now?" Sadly, IDG has not bothered to inform subscribers what will happen going forward. Which is pretty emblematic of the issues with the company. In an article on the Macworld site, they say, "If you’re a current print subscriber, look for information about your new subscription options in the November issue of the magazine." You're SOL most likely. I was just ripped off by IDG for a 2 year renewal. IDG doesn't have any other magazines I want; if they did, I still wouldn't subscribe since IDG has proven they are just a bunch of scam artists. This is so sad. IDG had a really good crew and the founder (who recently died) seems to have known it, and kept Macworld going even though it had one-third the subscribers it had before the internet killed print. It's galling that IDG would so abruptly and callously toss hardworking longtime writers and editors, especially right after pulling long and grueling hours covering the latest Apple event. My understanding is that Chris Breen remains employed at Macworld, but I don't know who else is. A dark day. I've just lost a lot of respect for Chris Breen; he should have resigned in protest. That's easy to say, but it's tough to find steady work in this industry, and the market has suddenly been flooded with top talent. It's not always feasible to walk away from a paycheck when you have bills to pay and mouths to feed. I suspect Chris has bills to pay and a family to support. I would never fault anyone who is not rich enough to not have to work for not leaving a job. I suspect Chris will be moving on when he's lined up something else. I concur, you've got to put family first and bills don't pay themselves. Chris has been there a LONG time and through many layoffs, reorganizations, edits in chiefs, vice presidents and cost cuttings. I'm betting he stays. Thanks for all the kind thoughts, folks. As a now former Macworld staffer, I'm sorry to see the print pub go, but even sadder to see so many of my colleagues unemployed as well. Truly tremendous people, and it was an honor to work beside them all. Where will the web edition get the Mac informed writers. What will the quality be. Part of the value of an informed staff is the mediums believability. How come MacWorld UK stays open??? It can't have the same kind of circulation that MacWorld US has. It's own by IDG, why didn't they combine staff and put out one magazine? That was always I thought the biggest waste, to have a MacWorld US and then half the stories on MacWorld UK. Again I have to wonder if the "suits" realize this and thought about this. Seems so dumb to have so many folks out of work when there is a need for the magazine. My understanding was that many of the international editions of Macworld were actually separate businesses licensed to use the Macworld name and some of the content. But regardless, the big IDG reorg that caused some of this puts all the U.S. properties together, so what happens in one division may not in another. Only problem, how are these foreign Macworld's going to put out issues without Macworld US? I also get Macworld UK through Zino and halve the issue is stuff from Macworld writers, the same one's that have been given their walking papers. So the content on that magazine will be very low come January when they won't be able to use MacWorld US staff for stories. (or use the stories from MacWorld US). I just think that the folks at IDC didn't think this out. With digital becoming the norm you can do a ONE digital edition that goes all around the world, not to just USA or UK. Do these suits at IDC, who have not shown us much in the last ten years, realize this and think about global coverage instead of just to the USA??? Puzzling, but those same folks that run IDC are probably having Martini's and a big steak right now at their local Ruth Chris trying to figure it out. (along with keeping their six figure salaries). I'm guessing that macworld.com will still generate a fair amount of content from freelancers, and that's what the international Macworlds will use. "how are these foreign Macworld's going to put out issues without Macworld US?" Remember, the foreign Macworld's are separate entities run by separate companies. IDG licensed the name "Macworld" to them but doesn't run them. I don't know anything about life at IDG (or IDC) or any other big publishing house, but I'm surprised to hear that managers get six-figure salaries. Do we actually know that that's the case? ALL of the UK Apple magazines are better then the USA ones. I get them in digital form but used to get them in print. I don't see why there would be a correlation between Apple's success and a potential readership for MacWorld. A lot of Mac users I know are happy to just have their computers work. And if their computers don't work, there's the so-called Genius Bar. Or the tech guy at work. Apple is successful in no small way because they serve a lot of people who aren't interested in what happens under the hood. I've heard this before. It's misleading at best. There is a broad range of Apple users, from computer experts to novices. We MAC / iOS-using computer experts also enjoy the reliability of Apple stuff and the care they (usually) use designing the UI. What about PC World? Are they next? "What about PC World? Are they next?" IDG owns PC World too. If they couldn't make a print version of Macworld work, there's no indication from IDG they can make a print version of PC World work for much longer. PC World went digital-only in July 2013. See that they have a new staff for MacWorld.Com. Guess they stoled some folks from MacLife to run MacWorld.Com. They also seem to have some "young" faces, probably getting paid intern wages. I tried to post a comment on their board on how we will miss the old writers that we loved and trusted all these years and it was taken down. Guess the new folks don't believe in freedom of speech over at the new MacWorld. Again another message to the readers that we better not expect good journalism because IDC are going to hire folks on the cheap to learn how to write for the internet. Guess since we aren't paying for the service it doesn't matter anymore. Guess they stoled some folks from MacLife to run MacWorld.Com." Stole? Not even close. There are folks who used to work at that rag who now work at Macworld but it's s small, incestuous business. I'd be surprised if there *weren't* people from other magazines at Macworld. The correlation is purely financial. With Apple selling vast numbers of devices and there being many companies in the Apple ecosystem trying to reach potential customers, one would think there would be sufficient advertising dollars to support a print magazine with 160,000 readers. Apparently that isn't true, although a German reader told me that Macwelt and Mac & i there seem to be doing fine, with about 20,000 readers per issue each. I will bet you that MacWorld UK has less than 40,000 readers. It's run by IDG UK which I will bet has a smaller and less costly operation. That is why I am adamant about using the term going to Ruth Chris for steak and martinis and how they make six figure salaries. Lots of companies like IDG has big staffs of folks that you really don't know what they are doing. In the long run that is the reason for this action. Companies like IDG always look to cut salaries of those that work hard on a product, they never seem to cut the real problem, big executives. You work for Tidbit and also do those Take control publications, you run a mean and lean operation in cost. You probably do 10 to 15 different jobs. That is why I hate corporate America, the middle class, those that work hard are getting wiped out. That is what happened at MacWorld, they needed to save some money, unfortunately for those that have worked hard over the years and made more they got cut. @Adam: One difference in Germany is that people read a lot more, and they also do some of that in print. To be sure, print is under pressure there too, but I still see much bigger assortments of magazines at train stations, and there are still more bookstores than I see in big American cities. So that might be part of the deal there. No! MacWorld was such a high-quality mag. I can't believe this. Getting down to why this happened, all those writers at MacWorld had worked there a while and over the course of time made more money. That is what is suppose to happen in America, you work hard and work your way up the ladder in getting more money. So those folks were targeted by IDG because they made more money than the new folks that are coming in. Yes they probably needed to do something different, but they could of just dropped the print version and did the app. 50 to 60% of the cost of a magazine is print and postal service, so they could of done just the app once a month. But they save a fortune my doing it this way along with having a reason to get rid of staff. Again what is wrong with America, don't do a great job and make more money because some six figure executive will be looking to cut the budget by cutting the person making a lot of money for those young, upstarts that work for half of what the more experience person was getting. It's a shame. Sad to see it go, but it had become redundant the past several years. ahhhh --- (#$%&* --- didn't know editing deletes original post -- not a good idea :( "In reply to" should be called "Replacing". Thanks. Editing certainly shouldn't replace the original - it should just bring it up to be changed. Perhaps there was some sort of unexpected glitch, since I edit comments all the time with no trouble. Thank you to all the fine writers who have helped me and my circle of colleagues and friends develop our skills and expertise through the years. I would not be the person I am today without your help. Stand tall--you've done noble and good work which I know will continue. Condolences to all the laid off MacWorld mag. employees. It's pretty clear IDG has no empathy toward these people and to its subscribers. A visit to the IDG website just now reveals that they are still marketing the print version of MacWorld mag. Shame! Shame! Most of the independent developers of Mac software that have been around a while owe a good deal of their success to the well written and fair reviews in Macworld. Getting a good review in Macworld was a real honor and something of a "gold standard". We developers will miss them there for sure. All the best to all the great writers in your next Mac adventures! My thanks and condolences to the fine writers who helped so many of us gain knowledge about how to use Apple technology to make our lives better through so many years. This is a sad day. Also those IDG crooks just ripped me off for a 2 year renewal! I think I'll call and demand a refund. Obviously trying to rip off as many people as they can. Just canceled my subscription that didn't expire until May 2016. They promised to extend it two months through July 2016 if I didn't cancel. Crooks to the end. How did you cancel it? My subscription runs until 2017. And how can they extend a subscription for a magazine that is going out of business? There you can log into your account. On the resulting page was a link to cancel my subscription. I'm SUPPOSED to get a refund. You will be receiving a refund in the amount of $25.77. I'll look forward to its arrival. Prior to getting to that they did offer me to extend my subscription by 2 months if I changed my mind and didn't cancel. Update: I received the refund check today, 26 Sep 14. Anyone remember Call-A.P.P.L.E., Nibble (or was it Nybble), Apple Orchard, and most of all Softalk, among others? Ah, but the Apple II itself was dying as more and more moved to the Mac. My favorite Apple II mag was InCider. I started my MacWorld subscription in 1985... and stored all the well-read magazines in my library. My wife finally made me toss most of them, but I kept a special few. I also subscribed in later years to PCWorld. But when they shuttered the print version a while back, I decided not to renew my print subscription to MacWorld, fearing the end would be soon for that mag as well, and I didn't want the digital version instead. Looking at my library stash, the amazing difference in magazine thickness from the 80s to the latter-days told the advertising tale. Also the MacWorld reporting in recent years was often superfluous and not of value, like the in-depth reviews of old. It was a wonderful computer resource in its day. Just got off the phone with a customer service rep at MacWorld. I called to cancel my subscription in protest of this short-sighted corporate maneuver. At least it made me feel better! She had nary a "sorry to lose you as a subscriber" comment despite my mentioning I had been a subscriber since 1985 and was canceling specifically because the print edition was no longer going to be available. Corporate robots. Just shows to go ya. "She had nary a "sorry to lose you as a subscriber" comment..."
Keep in mind the subscription services are often outsourced. She may not even know what you are talking about. Have been laid off and it's not pleasant. Enjoyed the contributions of all of these guys to MacWorld and was a long time subscriber. Guess I'll be cancelling that subscription now. Just got a MacLife subscription. Nice piece by Jason remembering Macworld. This is so sad. IDG is heartless for milking the staff and leading them on... only to cutting them after the show. With that said, a long time supplier, Dr. Bott, an Apple -centric web based sales co. is closing it's doors, too. So, whats' going on in the Mac community that is pushing these companies to close? On a happier side, just pulled out my 1987 Mac 512KE, (cracked open & upgraded to Mac Plus status). Started it up Monday Sept. 15th. The nostalgia of hearing the beep put a smile on my face. Opened MacPaint and my mind went back to the close to 30 years it has been around. Hard to believe I made C and D sized architectural drawings on that 9.5" screen. Info from the staff of MacWorld instilled enough information and confidence in me to upgrade the 512Ke and numerous other Macs, install AppleTalk & ethernet networks, learn and operate dozens of software programs. Idea: instead of being sad & missed, start another e-magazine. Thankfully, TidBITs is still around. Jason Snell has unveiled his new site, Six Colors. "So, whats' going on in the Mac community that is pushing these companies to close?" I'd argue that, while the number of Mac users has increased tremendously in the past ten years, the "Mac Community" has gotten significantly smaller. Not much to say except how sad I am for these remarkably talented people and their families. I thank them all for the years and years of hard work, wonderful insights and great knowledge of the products. I will miss them and pray they land on their feet - and pray harder that we will continue to read their work in another venue soon! I am grateful to you all and wish you nothing but the very best. Today, two weeks after I received my refund check, I received the November 2014 print issue of Macworld. The label still says my subscription doesn't expire for 2 more years and it has been 3.5 weeks since I canceled! I'm a teacher who purchases magazines with my money to place in racks at the alternative high school where I teach in Colorado (mix of iMacs, white MacBooks, Chromebooks, netbooks, and even eMacs). I'd just signed up for a two-year subscription after not subscribing for years -- only to find that my first print issue is MacWorld's last. I'm sadly going to cancel and request a refund. I just got my last print issue and on the front there was a paper that said they were switching to a digital magazine in pdf form. Now without a staff how can they do this? Wonder if I should keep the digital or cancel all together? They didn't fire everybody; just 90% or so. They kept a few "token" people like Chris Breen, Susie Ochs (a defector from Mac|Life), etc. I figure they'll be fired next year (or maybe just after they cover the event on Oct 16th). Personally, I don't think the digital version is worth the price. "Now without a staff how can they do this?" You may be misunderstanding this news. There is still staff at Macworld. Just significantly fewer bodies than there were before.